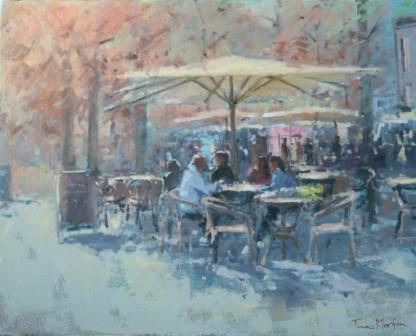 ''Lunch at Honfleur'' glows with light and life. Honfleur, a pretty port on the Normandy coast is well known among artists who enjoy the exceptional quality of light near the sea. Tina Morgan is known for her impressionist paintings. Here we see her skill in capturing the light and the lazy atmosphere of people relaxing on a sunny afternoon in Honfleur. Her use of a soft free style and subtle palette results in art work with a timeless quality. She creates a unique luminosity in her paintings. Tina Morgan has been inspired by a number of artists including Royal Academicians, Fred Cuming and Ken Howard. Today Tina is a member of the Royal Society of Women Artists. In addition to Red Rag Modern Art Gallery Tina Morgan has exhibited at other leading British Art Galleries. Each painting at Red Rag is sourced from the Tina Morgan artist studio and like all Red Rag British art and Modern art it can be shipped worldwide.